Neutral Density filters are used to reduce the quantity of light that reaches the sensor of the camera. They allow to decrease the shutter speed in order to achieve motion blur (waterfalls, ocean, clouds…) and/or to reduce depth of field in very bright conditions. As they are “neutral”, ND filters do not affect color rendition. These full ND filters can also be used to better separate subjects from the background by allowing wider apertures, effectively decreasing depth of field. Neutral density filters are one of the least expensive and most effective ways to dramatically improve your shots. The filters are double-thread, so you can stack your lens and other accessories as needed. And it is made of high quality optical glass. This filter also serves as a great and inexpensive lens protector. There is a 3 slots filter case to hold the 3 filters and a piece of lens cleaning. It will be much convenient to take along with on your trip. 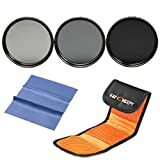 Neutral density filters, nd filter set, nd grad filter for CANON Rebel (T5i T4i T3i T3 T2i T1i XT XTi XSi SL1), CANON EOS (700D 650D 600D 550D 500D 450D 400D 300D 1100D 1000D 100D), Nikon (D7100 D7000 D5200 D5100 D5000 D3200 D3100 D3000 D700) and Sigma DSLR Cameras with 67mm lens. • Made of import optics glass and resin,top level of transmittance. • High quality product made of import optics glass and resin,top level of transmittance. • Metal sealing ring instead of the plastic sealing ring, better tightness, avoids fall or loose. • K&F Concept filters are renowned for their ability to minimise reflection at the filter surfaces which reduces flare and ghosting. NOTE: This kit is compatible with all 67mm lenses ONLY,Please verify your camera’s lens thread size before ordering. This number is always preceded by a “ø”(diameter) symbol.